Currently, the New York City Department of Urban Planning is in the public approval process of changing the zoning for East Midtown as a means of redeveloping the neighborhood. In this 73-block area surrounding Grand Central Terminal, the Bloomberg administration has proposed an increase in building height restriction to incentivize real estate developers to tear down old buildings within the business district to then replace them with contemporary skyscrapers. To efficiently allow developers to build higher, the city is basing its proposal around the creation of monetized air rights–a type of Tradable Developmental Right (TDR) that allow developers to build outside of the restrictions of the local zoning code. Sold within the designated area, formerly titled the East Midtown District Improvement Bonus Districts, the sale of public TDRs is a way to raise the funds for the public realm and transportation infrastructure improvements that will be necessary to accommodate for the increase density that will result from the plan. Although this plan prescribes more density for an already quite dense section of the city, in this paper, I will argue that if executed thoughtfully, the East Midtown Manhattan zoning plan has the potential to create economically viable, competitive, and aesthetically rich additions to New York City. Historically, the iconic forms of East Midtown Manhattan have defined New York City to the rest of the world. The proposed section of Midtown that would be affected under the proposal applies to the blocks in between East 39 Street to the south, East 57 Street to the north, Second and Third avenues to the east, Fifth Avenue to the west (Image: 1). Most notably, this district includes historical landmarks such as Grand Central Terminal and the promenade views of Park Avenue, the Waldorf Astoria hotel, and the Yale Club of New York. The Lexington Avenue subway and cross-town subway lines on 42nd and 53rd streets serve this district. Image 1: East Midtown highlighted in red. Image from the New York City Department of Urban Planning.In the later half of the 20th Century, East Midtown Manhattan became New York City’s premiere central business district. Now, it houses 14 Fortune 500 Companies and as such, it is a major contributor to the city’s tax base, providing what the city considers to be some of its best 70 million square feet of office space, accommodating approximately 200,000 workers. But according to the findings of the Urban Planning Commission of New York, the central business district is not growing: less than 5 percent of East Midtown’s total office floor area was built in the past 5 years, with only 2 new office buildings constructed in the past decade–both medium sized–while the last major office development was completed in 1999. Older than London, a commercial district developed 60 years ago, and far older than new global business centers like Shanghai, only 10 years old, 80 percent of office buildings in East Midtown are over 50 years old (with an average age of 73). Due to a combination of both a lack of physical growth in this district, and the potential attraction of Class A caliber buildings in competing cities like London, Tokyo, and Chicago, the city has concluded that East Midtown is not performing well in regard with the provision of up-to-date office space. The Bloomberg administration has decided that the lack of Class A office construction in the area over the past two decades is a threat to the long-term performance of the business district and to the vitality of the city. Bloomberg’s urban planning commission is fearful that the district will not retain its reputation as “the best business address in the world.” The preexisting structures also lack the large “column-free spaces,” tall ceilings, and environmentally efficient features, now sought by many corporate tenants. As with the recent zoning changes in Long Island City and Hudson Yards, Bloomberg and his administration do not look at the city with the eyes of one of its millions of annual visitors, who are very satisfied to catch a glimpse of the city’s physical status quo. In the eyes of Bloomberg, Midtown Manhattan could just as easily fall into a serious decline as it could create roughly 5 million new square feet of housing by 2033 (an increase of 5.5 percent) as a result of this rezoning plan. In his proposal, he calls for “iconic new buildings” to redefine Midtown. However, current zoning regulations limit the ability of the private market to construct these new “icons.” In New York City, Floor Area Ratio (FAR) is the principal bulk regulating metric used to control building size. In short, FAR is the ratio of total building floor area to the area of its lot. Each New York City zoning district has a codified FAR which, when multiplied by the lot area of the zoning lot, produces the maximum amount of floor area allowed on that lot. For example, on a 10,000 square foot zoning lot in a district with a maximum FAR of 1.0, the floor area on the lot cannot exceed 10,000 square feet. 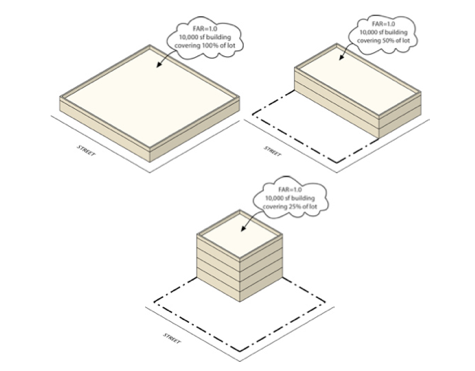 Of course, with other zoning and building code regulations, buildings tend not to be the size of their lots, and the FAR figure does not simply equal floor height (Image: 2). Image 2: Different ways FAR can be calculated. Image from New York Dictionary of Zoning.FAR is really a ratio of building to lot size, and it’s helpful to think of it in terms of other buildings. For example, at 59 floors and 3,140,000 sq/ft, Pan Am/MetLife tower, one of the area’s behemoth office buildings that currently looms over Grand Central Station has an FAR of 18, while at 47 floors and 1,200,000 sq/ft, the old Bear Stearns headquarters around the corner–at 383 Madison Avenue–has an FAR of 21.6. Just down the street from the Old Bear Sterns Building, on 42 Street, at 55 floors and 2,100,000 sq/ft, the recently finished One Bryant Park, one of the biggest buildings in the city, has a FAR of 24. These behemoths are examples of the type of large office buildings that are already present in the Midtown proposal area. However, they are by no means the average Midtown building. In the Midtown Development District, the majority of FARs are set at 12.0 or 15.0, with a special zoning Bonus District in the immediate area surrounding Grand Central Station that allows for the area’s highest construction limits. But this doesn’t necessarily mean that Midtown is all on the larger end of medium-sized office towers. The neighborhood has many “dwarfs” that would instantly become more valuable as soon as the potential for the height of the development on their lots is raised. Under the proposed zoning changes, this height limit will increase by 20 percent, which would raise the current 12.0 and 15.0 FAR limits to 14.4 and 18.0 FAR respectively (Image: 3). 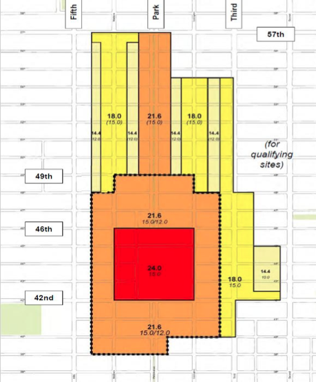 Image 3: The breakdown of base FARs as according to the East Midtown Rezone. Image from the New York City Office of City Planning.With the new proposal there will still be a Grand Central Station Bonus District, a special area where the city has designated developers to construct taller buildings with a base FAR limit of 21.6. Within the Grand Central Station Sub District, the city has even proposed a Bonus District to include the couple or so blocks surrounding Grand Central Station where the FAR will be raised to 24.0. In addition to the expansion of building heights in the Grand Central Bonus District, the plan also proposes the creation of the Park Avenue Subarea, where FAR increases would be permitted up to 21.6 FAR in special cases, an increase on the existing base maximum FAR of 15.0 (Image: 4). 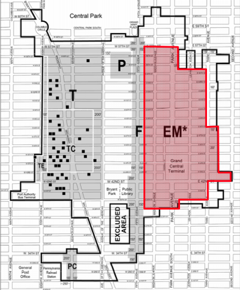 Image 4: The breakdown of the East Midtown rezone subdistricts, with the space for behemoth developments in the GCT zone. Image from the New York City Office of Urban Planning.To regulate the additional building height made available in both the Grand Central Station Bonus Districts and the Park Avenue Subarea, under the plan, developers would have to purchase Transferable Development Rights (TDRs) from the city. These rights are the results of the monetization of public space–the sky–and would be held and managed by the city in what is called a District Improvement Bonus (DIB). The DIB is the legal financial mechanism that allows for the immediate collection of the funds raised from the sale of the TDRs within the new Bonus District. The BID then takes these funds raised from the sale of TDRs to developers in the BID and invests them back into the physical infrastructure of the BID to fund public realm improvements including the area’s public transportation, green, and pedestrian infrastructures. According to Landauer Valuation & Advisory, the private appraiser the Department of Urban Planning hired to appraise the value of the proposed TDRs, over time, the adjusted “fair market value” for a foot of TDRs will be about $250 a square foot. 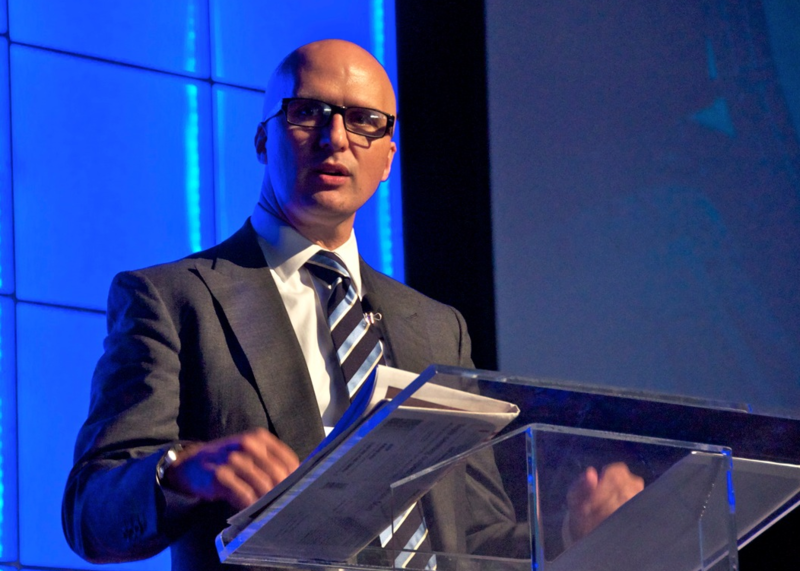 The Landauer report concludes that from the sale of TDRs, the BID will raise as much as $750 million. Again, these funds will go to finance public realm green-spaces, new pedestrian expansion, and expanded public transportation access designed to ease any of the new density pressures added to the area as a result of the increase of people to the area. Specifically, wider sidewalks, larger subway platforms, and a new set of public plazas along a potentially pedestrianized part of Vanderbilt Avenue have all been proposed as public realm improvements to offset the negative effects of the increased density that will result from enacting the plan. As the final piece of new zoning machinery, the city has proposed a Landmark Transfer Zone to apply to historic properties that fall within the area of the Grand Central Bonus District. As per New York City Law, historical landmarks are the only properties that can fully transfer their TDRs to other entities (in other words, their air rights are neither publically held nor managed). With these transfers, a historic landmark can sell the TDRs they have to another landowner in the district in order to raise money and not have to worry about being priced out of the booming district. If a landmark sells 100 feet of TDRs to the building across the street, the building across the street now has access to build on another 100 feet of the vertical space that sits above the property. Within the Grand Central Sub District, Historic TDRs are the last means of adding the extra couple thousand square feet to a new skyscraper building. For example, if a historic landmark in the Bonus District, let’s say the Yale Club of New York, sold its air rights to its across the street neighbor, the neighbor would tack those credits onto her building to build higher. Now, the neighbor would be able to build higher than the base area’s FAR (see NYT: “The Great Race for Manhattan Air Rights“). When Bloomberg announced his plan for Midtown, he gave yet another example of the zoning based economic development strategy that he’s used in other business and residential districts. This Midtown plan aims to regulate private market development with new standards for commodifying scarce resources (in Midtown FAR is the commoditized resource, but in Chelsea, on the Highline, the rights to real estate adjacent the Highline are that resource). In Chelsea, Hudson Yards, and Long Island City, zoning regulations that regulate building form (and not use) to align with what the Bloomberg administration deems public interest have been an effective means of guiding private market growth. Through these plans, Bloomberg has been able to levy new incentives to inspire his own desired private market outcomes: he is using these large-scale zoning makeovers as part of his grand redevelopment strategy. By using zoning policy to align the city’s interests with those of private real estate developers, instead of using his public policy pulpit to arm wrestle developers into submitting to the city’s interests, Bloomberg has become NYC’s master real estate developer. The TDRs are sold to raise money for the city on the basis that taller buildings create density that creates more congestion, pollution, and general demand for public investment: taller buildings in New York City create a negative social cost. TDR programs accordingly “regularizes and standardizes the price developers must pay to offset the impacts their developments will have on the community and again bring greater transparency to the process.” Through the sale of TDRs, participation in the DIB can be seen as an exaction for developers: they can have their building height, but they’re going to have to pay for it. The same notion goes for the use of TDRs in the Landmark Transfer Zone to preserve historic landmarks in a changing area. 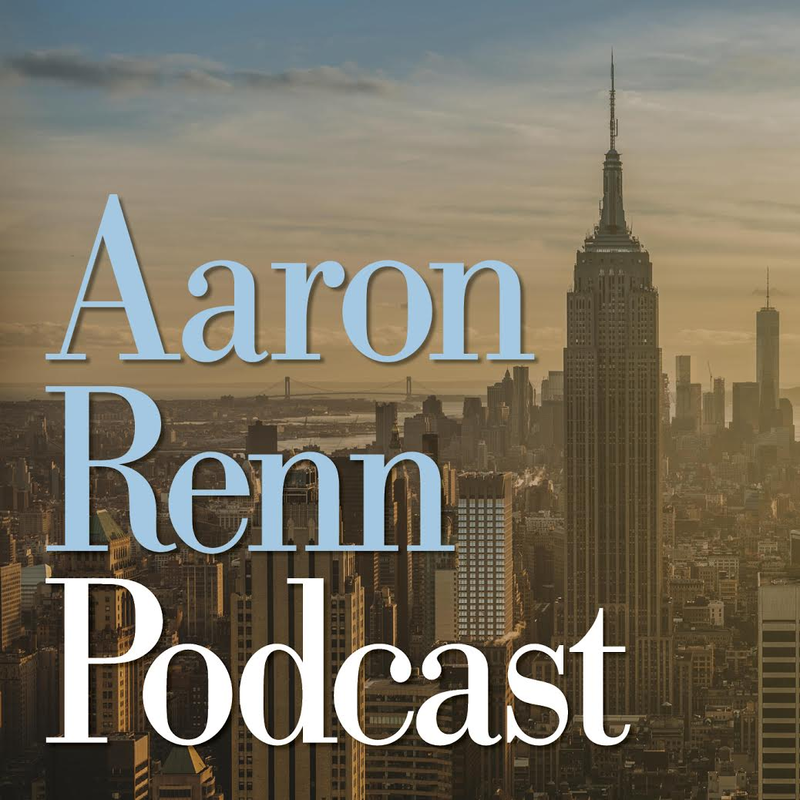 Public policy theorists have lauded uses of TDR programs, like Bloomberg’s Midtown East proposal, as tools to negotiate tensions between conflicting interests such as future development vs. preservation of the past, and density vs. efficiency. Bloomberg has clearly harnessed this power of TDRs as his plan views unused development potential, as seen in the proposed use of BID funds for public realm improvements, as a public–rather than solely private– resource used to regulate the aforementioned tensions. To the Bloomberg administration, zoning and the monetization of public TDRs are a means of aligning public interests with the private market. Garvin, who is widely credited with creating the term “public realm” to describe the collection of pedestrian friendly spaces in a city spoke frankly that in its broad approach, the proposal would eliminate New York City’s unique sense of place, an opinion that his colleague, Dean of the Yale School of Architecture, Robert A.M. Stern, took in his Sun., Apr. 21, 2013 editorial in the New York Times. Stern, who is himself the architect of some major Manhattan real estate, opined that “The advantages of density can go only so far without the infrastructure to support it.” He postulated that the literal rise of larger buildings might irrevocably affect the public realm of New York City, and fears that the famed New york City skyline might become indistinguishable from the city of Shanghai in the 1990s which saw major growth in the size of its central business district, but experienced a “Scaleless urban moonscape below” as a result. A report composed by the Municipal Art Society (MAS) of New York “East Midtown: A Bold Vision for the Future,” advocates for a rezone that considers the current state of the economy as a part of its proposal, arguing that in the near future, the housing-less Central Business District might become obsolete. “Talent gravitates toward neighborhoods that are real places – with walkable streets, unique architecture, great restaurants and other opportunities for socializing and amusement,” the report concludes. “The number and mix of business types are important for the economic health of the neighborhood.” Garvin piled on as he too wondered how a new fleet of large Class A tenant office buildings fit the needs to the contemporary economy. “How’s a tech startup supposed to incubate in a space like this, and when would Facebook ever need it?” he wondered. On top of these concerns, other arguments against the plan include an overvaluation of the demand for office space in the city, and then the constant argument against any type of real estate development–uncertainty vis a vis time. However, the resounding successes of past zoning proposals that adapted smaller scale TDR mechanisms into their zoning frameworks, and the incredibly detailed nature of Bloomberg’s proposal serve to answer these valid concerns. To combat the concern that the plan would not do enough in way of creating public realm beautification, the city does claim, albeit hopefully, that it can make $750 million by the sale of its TDRs. These funds seem as though they might be enough to combat the concerns of these critics, especially if thinking logically about the structure of the DIB, which dictates that the more building is built, the more rights need to be bought, the more funds from the sale of TDRs will flow back into the coffers of the BID. But there is always the opportunity that these rights have been overvalued, or that the rights won’t be purchased soon enough to fund and meet the high demand for the public realm improvements, especially considering the volatility in the price of air rights in other parts of the city. But inherent in the design for the plan are a set of checks to regulate the area’s largest buildings. The aforementioned criticisms do not seriously consider the implications of Bloomberg’s new zoning district. What none of these critics mention is that large-scale buildings that go beyond the FAR requirements in special districts will have to go through an extensive design review in order to be built. This means that if a skyscraper that blocks out the Chrysler Building is designed and proposed, the community can prevent such a building from ever being constructed. Not surprisingly, this section of the new zoning proposal has been unpopular with the real estate industry, as reported in the Sun., Oct. 7, 2012 edition of the Times in an article entitled: “Bloomberg Pushes a Plan to Let Midtown Soar.” Here, Steven Spinola, President of the New York Real Estate Board is quoted as being critical of this design approval provision, as the biggest buildings will have to go through rounds of review to win the required support of the public. However, Spinola, like most other developers or members of the real estate community, is still largely in support of the proposal. For Bloomberg, the termed out mayor who is set to leave office this December, there is no doubt that this rezoning plan could be one of his most substantial contributions to the city. While a new addition to the New York skyline under the proposed plan will be a physical marker of his tenure, Bloomberg has more quietly redesigned the regulatory guts of neighborhoods all around New York City, just as he’s proposed in Midtown. Without fear of the potential implications in changing the zoning framework, Bloomberg has tailor-fitted zoning based growth plans in a way that allows a neighborhood to use its assets (relevant TDRs) to naturally best serve its own growth. Throughout his term, Bloomberg has rezoned one-sixth of the city, and in this way, a taller and more dynamic midtown Manhattan might be the ultimate landmark of his legacy. Micah Rodman is an Urban Studies student at Yale University. Here’s a problem: the Yale Club of NYC is not Landmarked. Many landmark-worthy buildings in the Midtown East area are not, such as the great hotels on Lex, because they are built to their maximum FAR – making them less in need of protection. If the Midtown East plan had included major additions to the protected ranks, I think the opposition would have been less intense (and massive – I literally have not read or heard one voice outside of the development community that is for it).